MERRY CHRISTMAS EVERYONE!! Too early??!! I think not!! 😉 As the end of August approaches I think it's only right that we start to think a little as to what we will be reading over the next few months to get us in the festive mood! So wonder no longer! Lucky enough to share an exclusive cover reveal today on Books and Me with you thanks to the lovely folk at Choc Lit who have a rather gorgeous Christmas cover to share... are you all ready?!! As a wedding planner at Carrick Park Hotel Ailsa McCormack has devoted herself to making sure couples get their perfect day, but just occasionally that comes at a price – in this case, organising a Christmas Day wedding at the expense of her own Christmas. Not that Ailsa minds. There’s something very special about Carrick Park during the festive season and she’s always been fascinated by the past occupants of the place; particularly the beautiful and tragic Ella Carrick, whose striking portrait still hangs at the top of the stairs. Sounds like the perfect Christmas read so I for one can't wait to get my mitts on a copy! 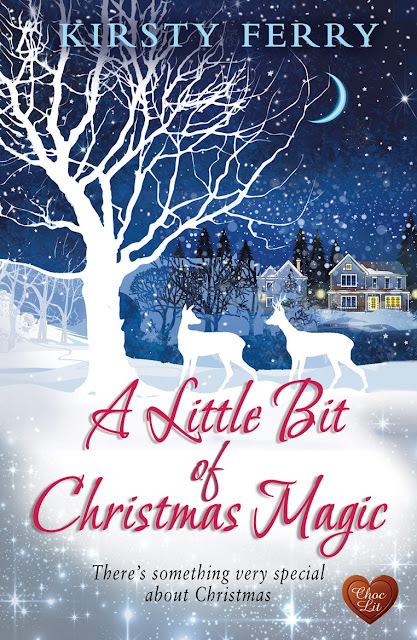 A Little Bit of Christmas Magic is a novella by Kirsty Ferry and will be released on the 24th October 2017!! Keep checking the relevant Twitter pages for more details!